Everyone wants to know how to get more Facebook Likes. Marketers have goals — whether from superiors or their own — focused entirely around a big, round number. Obsessed. And they’ve got it all wrong. Look, big numbers are fun. I get it. I’m approaching 3,000,000 total page views on this site. 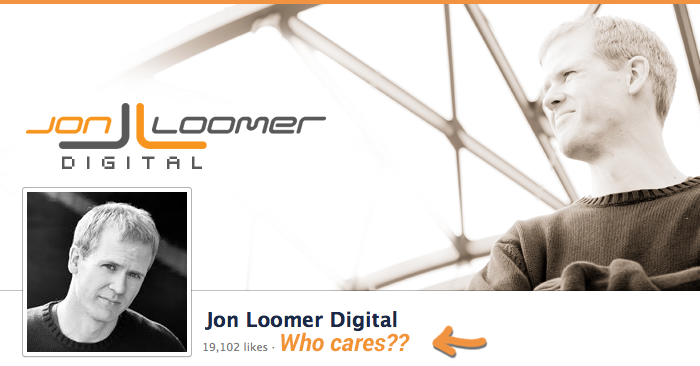 I’m also approaching 20,000 total Facebook Likes. But the number, in and of itself, means a whole lot of nothing. You should know why by now. Many brands, guided by this obsession, buy Likes. Or they pay for poorly targeted ads that net them thousands of Likes from bots and irrelevant countries. Or they run mainstream contests that bring in the masses. But when it comes to monetizing these people, such brands get the same results: Crickets. The problem is that this obsession for a number takes the brand’s attention away from what really matters. And such Pages that obsess over the wrong things are so easy to spot. Your content lacks value. It lacks direction and structure. It only sells and it’s sporadic. And your value proposition is far from clear. Why? Because the brand doesn’t know why someone should like their Page in the first place. They don’t. They hope “If you build it, they will come” will work. And when it doesn’t, they resort to tricks to inflate that number. Do you even know why you’re trying to increase Facebook likes, or is it no more than a number? I’ve had people come to me with the primary goal of building their Fan base to 10,000. Or 20,000. Or 100,000. They want to know how to get there as fast as possible. When you obsess over number of Likes, you are dehumanizing your audience. It becomes only a number. What you want is raving Fans. Fans are users. Users are people. People aren’t robots. People lead to business. Why should someone like your Page? What is interesting about you? What is unique? What value do you provide? Before you start talking about goals for your business on Facebook, you must be able to answer these questions. If you can’t, you’ll inevitably stray to focus on empty numbers. What can you share on a daily basis to make a person’s life better? This doesn’t mean posting a status update because it gets the most Reach. Or posting a photo because it gets the most clicks. Or using the call to action that gets the most bland responses. Know who your ideal audience is and what makes them tick. Know what they like and dislike and how you can make their lives better. Leave the cat photos and memes for someone else. Regularly and consistently publish valuable, self-less, helpful content. The purpose of the majority of posts should be to educate or entertain. Once you’ve defined your value proposition, craft your branding, imagery, tagline, content and strategy around THIS. Not a goal for a number. If you don’t do this first — if you don’t pre-define your value proposition — you can only build a number, not a business. And any results will be either hollow or unsustainable. Once you define your audience and your value proposition, building that audience — an audience of people, not numbers — becomes infinitely easier. When you focus on providing value, you will grow organically. But since you also know that ideal audience, it becomes far easier to define them when targeting ads. You know what they like and target those things in Precise Interests. You craft imagery and copy around filling the desires and needs you know they have. Of course, you have to first answer some difficult questions to get there. Increasing an audience on Facebook takes effort. Don’t take shortcuts. But if you put in the effort to humanize your audience and your message to them, you are much more likely to produce positive results that actually lead to business. And that — revenue — is the type of result you can be proud of.